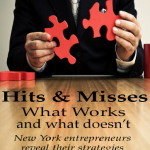 I’ve worked with Tina Traster for the past couple of years as the editor of one of her columns, Hits & Misses, a chronicle of the dramatic highs and lows that come with the entrepreneurial life, for Crain’s New York Business. When I found out that she’d recently compiled her articles in a new ebook, Hits & Misses: New York Entrepreneurs Reveal Their Strategies, I was curious about how she did it–and asked her to share her know-how with readers of the $200KFreelancer who might want to do something like this themselves. It turned out that she wasn’t a rookie when it came to self-publishing. In Sept. 2010, she’d released Burb Appeal. It’s a collection of her popular Burb Appeal columns for the New York Post–which she characterizes as “the antics, ravings and anecdotes of a city girl who moves to a quasi rural suburb in Rockland County, [New York] where everything is interesting, unusual and odd.” She hired Hen House Press to help with layout, formatting and cover design and then published it through Amazon’s CreateSpace program. She came out with a new version of the book, Burb Appeal Too, through Hen House press in 2012. The book is now available in paperback and in an Amazon Kindle edition and in a version for the Barnes & Noble Nook. Under her arrangement with Hen House, she retains all royalties. Traster is still experimenting with the best route to publishing her work. 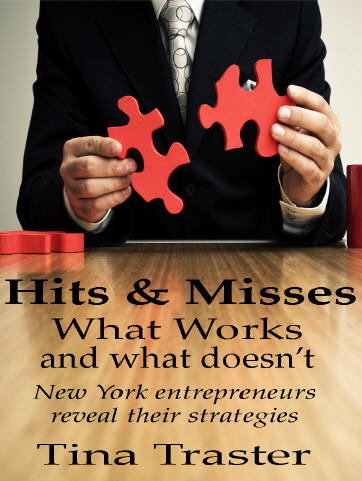 For Hits & Misses: New York Entrepreneurs Reveal Their Strategies, she used Hen House Press as her publisher. Beyond helping her prep the manuscript, the firm is involved in helping her on the sales front–and shares royalties. Traster had to invest both time and money in these projects. Organizing her columns by topic was a big part of each project, she says. She estimates that the up front cost of self publishing an ebook and print-on-demand paperback book combination is about $1,500. But there’s been a decent reward. She estimates that she derives about 5% of her annual income from her efforts to date, primarily from Burb Appeal Too. Traster also points to another benefit of publishing ebooks: She believes that her increased visibility helped her to win a contract with a traditional publisher for an upcoming book she is writing about adopting a daughter, now 10, from Russia. “It’s a story of a mother’s hope, pain, love and redemption,” she says.